On February 22, 2016, the United States Postal Service will release a new, one-ounce, international-rate stamp: The Moon Forever. The Moon is a fitting choice for a Global Forever commemorative stamp, because exploration of the Moon has always been an international endeavor. Even though the Apollo program was led by the United States, analyses of its valuable lunar samples involved scientists from around the world from the first day they were returned to Houston. The spirit of that international endeavor has continued over the past half century, during which a growing number of nations have reached lunar orbit and landed on the lunar surface. There is a growing realization that the Moon is the best and most accessible place to explore the origin and evolution of the Solar System. As capabilities, such as NASA’s Orion crew vehicle, it’s Space Launch System, and ESA’s Orion service module, are being constructed for flights beyond low-Earth orbit, mission concepts that utilize those capabilities are being developed. In support of the multi-agency International Space Exploration Coordination Group, which has been pursuing a Global Exploration Roadmap, human-assisted robotic sample return missions are being studied. One of those concepts, called HERACLES, could return to Earth exciting new samples that test fundamentally important concepts, such as an early globally-magmatic phase for the Earth and Moon and a subsequent period of severe asteroid and comet bombardment that completely resurfaced the Earth and Moon immediately prior to our earliest evidence of life on Earth. An international group of students recently helped design two potential traverses for the rover in the HERACLES mission concept and will be presenting those results at the upcoming international Lunar and Planetary Science Conference (Martin et al., 2016; McDonald et al., 2016). The Moon remains a guiding light of space exploration. For one day a year, the global community is invited to look up and take notice of Earth’s nearest neighbor in space. International Observe the Moon Night (InOMN) is an annual worldwide public event that encourages observation, appreciation, and understanding of our Moon. The 2016 event will take place October 8th. 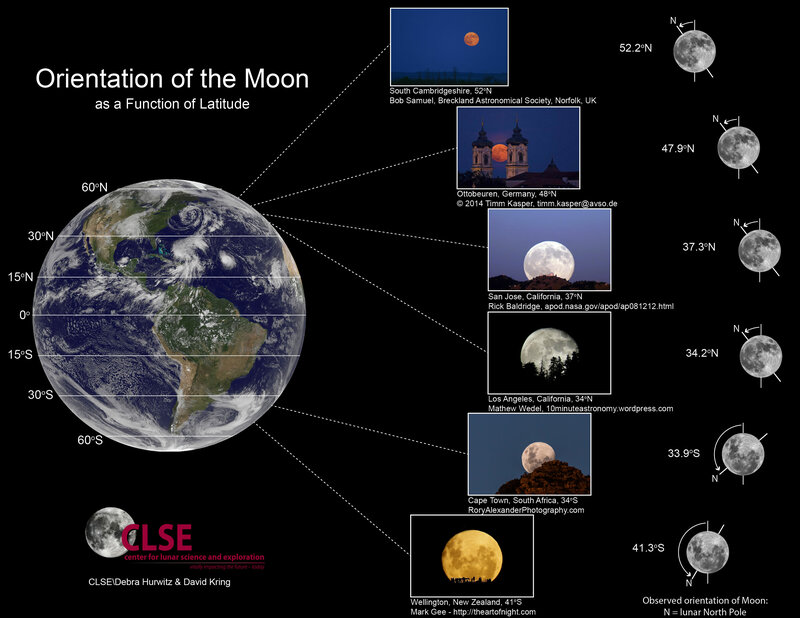 If you are wondering what the Moon might look like in other parts of the world, take a look.